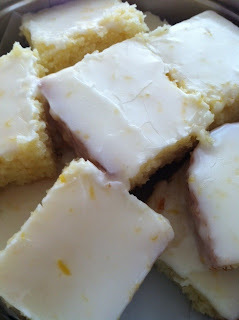 Posted May 21st, 2012 by Lisa & filed under brownies, lemon, lemon juice, Quick and Easy. We seriously couldn’t have asked for better weather in NYC this past weekend. In fact, I don’t think I realized how much I missed the sunshine until two gorgeous days were bestowed on us. 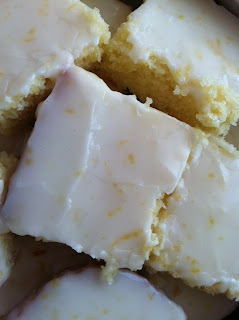 Subconsciously, though, I must have been associating my craving for the sun with lemons because all I could think about was making these fabulous Lemon “Brownies” from Bakergirl. Full disclosure: Although the photos are mine, this is not a TRB original recipe. I discovered this one on Pinterest (where I find some awesome recipes lately!) and just had to try it. I switched up the method slightly, which may be why my Lemon “Brownies” turned out to be a bit more “cakey” than Bakergirl’s. The next time I make this recipe, though, I will use an 11×9 pan and double the ingredients to yield larger servings — I know my family and friends will appreciate it! 1. Preheat oven to 350 degrees. Grease an 8×8 baking dish and set aside. Zest and juice two small lemons. 2. Beat the butter with the sugar until light and fluffy. Add eggs one at a time and incorporate after each addition. 3. Add flour and salt to butter mixture, followed by lemon zest and lemon juice. Mix until all ingredients are well combined. 4. Pour batter into prepared baking dish. Bake for 25 minutes or until edge turn golden brown and a toothpick inserted into the center comes out clean. Let cool for at least 30 minutes. 5. Prepare the glaze: Mix powdered sugar with lemon juice and lemon zest. Pour over Lemon “Brownies” and spread with a spatula. Refrigerate to set. Which do you prefer when it comes to brownies — lemon or chocolate? Share your opinions with us. Post a comment below.